I was really very excited in getting this book. I was eager in making a review of this book too. Here is my hands-on book review. First of few facts about the book. This book is written by Ahmed Faiyaz. He is an young and vibrant author I should say. This is actually a very good start for his writing interest. The cover page of this book is simple and cute. The back page has few cartoons illustrating few incidents mentioned in the book. The idea was Ok.
About the characters, there are four main characters namely Sameer, Tania, Vicky and Tanveer. The gang is friends from the college and their friendship is strong. The book revolves around these four characters. So the main intension of the book was in exposing the kind of bonding between the four, their career and their love interest. In simple the way of lives of the four. The characters were well described. Kudos to the author! “Life is what happens to you while you re busy making other plans." The language is simple. The character descriptions are very good. This made me think of a person I have met in my life for each character. I was very much attracted to Tania, Sameer and Vicky to the most. One thing I would disagree is that, all the four had the same phase in each part of their life. Like if the chapter name is change, all the four had few changes in their life. If the section is Falling apart, all the four had break ups. Else I love the story and definitely a page turner. This book can make a hit among youngsters. Simple and stylish way of telling the story I can say. This book was addictive and I didn’t put it down. The love story between Sameer and Tania which had ups and heart breaking break up. I was depressed while reading their break up; Tanis wedding with Ankur and Sameer and Simone togetherness. Vicky is all flirtatious, charming and attractive. 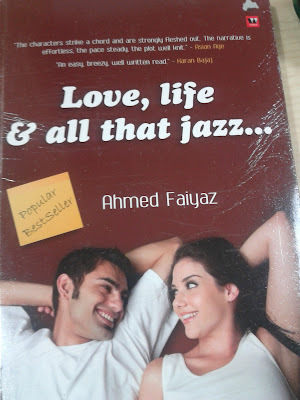 Hence I could say,” Love, Life and all the jazz ..“is full of love, flirt, break ups, taking life as it comes, friendships, bonding. In my opinion, this book is all about the younger generation’s attitude towards love and life. I even wondered something was missing in each relationships mentioned in this book. That minus fact is not about the author; it is all because of this generation’s change in mindset on love and career. 1. Respect your partner as you expect yourself to be respected. 2. Being connected is all makes a relationship live. 3. Give space to each other; Respect and encourage your partner's dreams and goals. 4. Never doubt your partner on silly things. 5. Value your love more than anything in your life. This is a must read book I could say. Well Done Ahmed Faiyaz. This review is a part of theBook Reviews Program at BlogAdda.com. Participate now to get free books!